Sales are the life-blood of your women’s footwear business. Having a fine-tuned curated list of fashion retail buyers is key. That’s what you will find here. Make retail appointments and connect with your target group of buyers throughout the year when open-to-buy dollars are available. It’s all about the list! Researching, building, and verifying a quality list of footwear buyer contacts is time consuming. We know, it’s what we do. The editors at WeConnectFashion are the trusted go-to source for fashion industry contact lists since 1998. Verified and compiled by WCF editors. Reach a targeted group of contacts with a quality list of women’s better shoe stores and retail footwear buyers. You choose 400 or 900 contact names, $350 or $775. 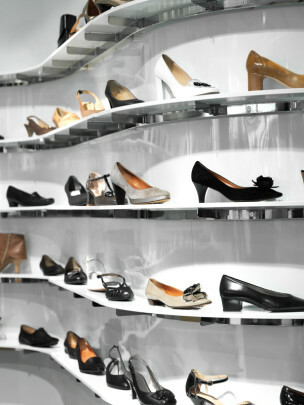 Direct your sales message to retail decision-makers who are responsible for selecting: women’s, missy and girl’s shoes. Locate women’s footwear buyers who purchase: ladies shoes, contemporary footwear, dress shoes, boots, casual shoes, and athletic footwear. Junior sizes are also included. Retailer price points range from: popular, moderate, better, contemporary, bridge and designer. If you have questions about price points, learn more about Price Point Descriptions. This package includes: department store, specialty chains, boutiques and some catalog retailers. This Sales Leads list includes buyer contacts at stores, such as: Shoe Hive, Foot Candy, Saks Fifth Avenue, Ruby Slippers, Butter NY, Girl Shop, Bill Hallman, Macy’s, Fred Segal, Lisa Kline, Intermix, Scoop, The Shoe Box, Parisian, Tracey Ross, Dillards, Sgt Leisure, Apropos, Coco Roco, Deena Hahn, Fetish, Fred Segal, B E Mick, and Gadzooks. Titles that may be listed are: CEO, Owner, Co-Owner, President, Vice President, Fashion Director, DMM, GMM, Regional Merchandise Manager, Manager, Senior Buyer, Buyer, and/ or Assistant Buyer. This list is sent to your email address as an excel file attachment. Some lists may take 1- 3 business days to verify, others are emailed immediately.